If you love grilling and you love salad, then this recipe is for you. It might sound strange, but grilling romaine lettuce is a true game-changer – the outer leaves char on the grill, adding a smoky, almost meaty flavor to the salad. 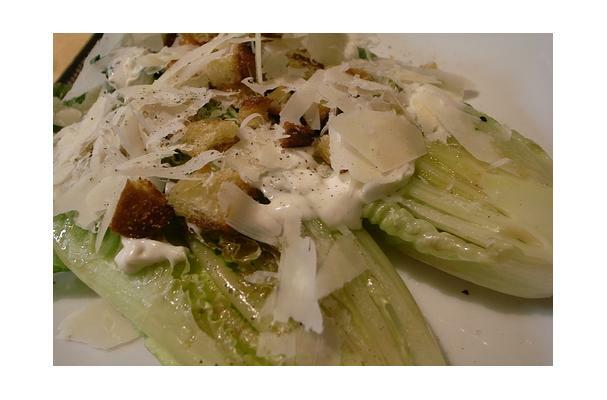 The smoky taste is the perfect compliment to a traditional Caesar salad with Parmigiano-Reggiano cheese. Seriously, you’ll never go back to normal salad again. 1. Combine ingredients in a pint-sized jar or dressing container by shaking the container. *The dressing is good up to a week after it is made and placed in the refrigerator. 1. Rinse and pat lettuce dry. 2. Cut the lettuce heads in half length wise. 3. Brush the halves with extra virgin olive oil. 4. Place on grill for 4-5 minutes, turning occasionally. 5. Remove halves from the grill and place onto serving plates. 6. Drizzle with the Citrus Caesar Vinaigrette dressing. 7. Shave Parmigiano-Reggiano over each half and serve.